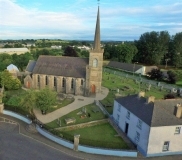 Saint Paul’s Church of Ireland Church, Pearse Square, Mountmellick is a Detached Georgian Gothic Church of Ireland church, built c.1820, with a steeple. 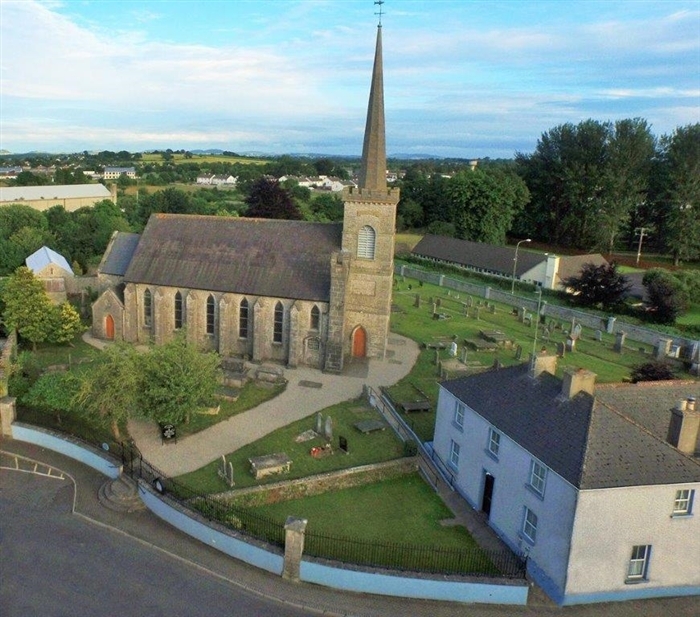 The graveyard which surrounds the church building is an oasis of peace and quietness in the busy town of Mountmellick. There are many interesting monuments and headstones here, and one of the oldest gravestones is dated 1709. A new extension to the graveyard was added in 1981. 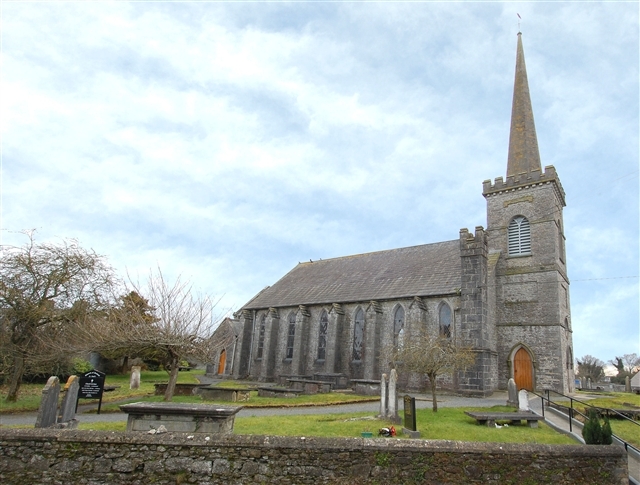 This Group of Parishes is situated in Co Laois and is made up of three parishes: St Paul’s, Mountmellick, St Brigid’s, Rosenallis and St John’s, Coolbanagher. 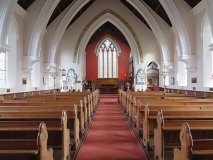 Rosenallis and Coolbanagher tend to be rural and farming congregations while the congregation at Mountmellick has traditionally included many traders from the town. There are around 100 families in the parish, a small parish school and an active Mother’s Union. The original Church on this site dates back to 1665 as a ‘Chapel of Ease’ for Rosenallis Parish (an ancient site of Christian worship). The oldest gravestone in the graveyard is dated 1709. 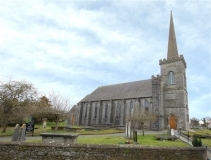 The growth of the town of Mountmellick meant that a new place of worship was needed and a detached Georgian Gothic Parish Church was erected in 1828, paid for mainly by the Board of First Fruits (a central Church body). The Church became a Parish in its own right in 1870 and was dedicated to St Paul in the 1950s. There are memorials to many of those who made donations over the years. In 1868, the present Font was donated to the Church while in 1870, major building work was undertaken. This included the building of the Chancel (at the front of the Church), Vestry (robing room for Clergy) and the replacement of the original steeple with a spire. From the outside of the Church, you can see the original side entrance doors to the Church. 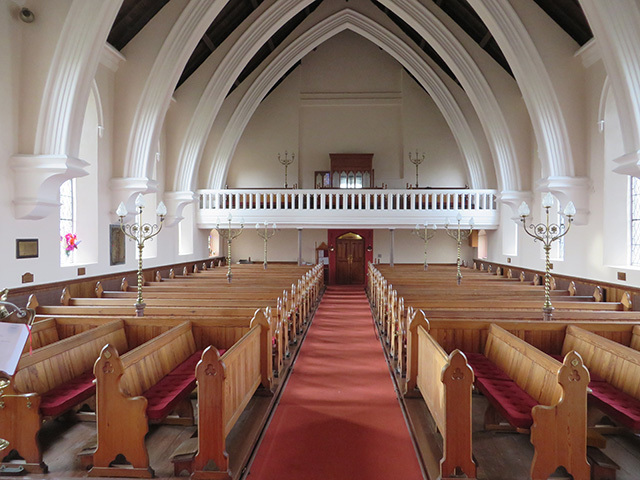 You will notice that the pews are numbered, this is a legacy of the times when pews were paid for (the closer the front, the larger the fee!). The 1890s saw the addition of both a new brass Lectern (the stand for the Bible) and a Pulpit made of plaster and marble. The organ was made by Peter Coacher and Co, Dublin in 1903 and an extension was built to for it. 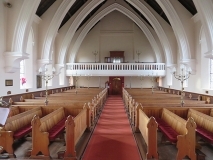 The gas lighting was fitted in 1903 and the fittings, which have been retained, provide an interesting feature in the Church. Around this time, the spire was damaged by lightening, you can still see the repairs. The Holy Communion Table and Communion rails were donated in the 1930s. The relief designs on these reflect the designs of local Mountmellick Work (a form of white on white embroidery). 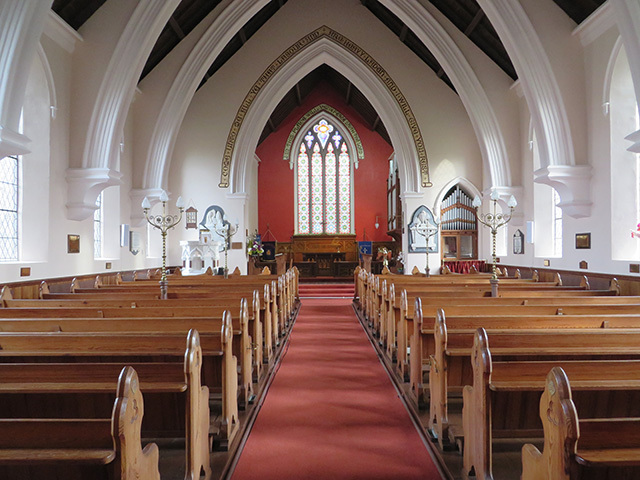 Holy Communion cloths were made by a parishioner in Mountmellick Work in the early years of this century and the pew cushions are also a recent addition. The original parish school and school house were built in 1848. A new, purpose built school was built close by in 1976. In 1896, CL Hutchings wrote ‘looking back at Mountmellick in its prosperity, we are reminded of the many industries which from one cause or another have now ceased to exist.’ By the early 20th century, the town had changed from a manufacturing to a commercial town, with many large retailers present on the main street. These traders and their employees were the backbone of the parish community. Larger retailers all employed staff ‘serving their time’ as apprentices, who lived in accommodation provided. They were often encouraged to sit in the gallery in St Paul’s. The married couples and families tended to sit in the main body of the Church. The local YMCA Hall (on the site of the old Quaker meeting house) hosted many social entertainments, including legendary dances where many a ‘match’ was made. The decline of the retail importance of Mountmellick has impacted on our church community today. We continue to take pride in our heritage and look to a new future as God leads. As a result of the need for fundraising in 2010/2011 a new social group came into being who organise regular social and fundraising events. In 1996 Cecil Thompson started Whist Drive evenings in the Old School House in the Church grounds, together with his wife Nellie and they ran every Thursday evening without fail until 2011 when Cecil decided it was time to retire, but with the help of Peter Stephenson Cecil continued and Thursday evening is still Whist Drive evening. All the proceeds from the Whist Drives are ploughed back into keeping the decor and upkeep of the Church in tip top shape. Nellie Thompson also runs a Charity Shop in the town of Mountmellick and the proceeds from the shop are spread between all Churches and other deserving causes within Mountmellick.